If you've received an invitation to join a shared Google Doc that you weren't expecting, you might want to steer clear of it. It's probably a phishing scam that could compromise your account. Internet users everywhere are being spammed with what appear to be malicious invitations to log on to their Google accounts. Unlike your garden-variety cyberattack, many of the telltale signs that could tip you off that something is awry are absent. For example, the attack appears to work by tricking you into logging into your actual Google account, then granting a third party (your attacker) access to your account's data. Having gained permission to access your contacts, the attacker then fires off spam invites to everyone in your address book. What makes this attack so tricky to detect is that it takes advantage of Google's legitimate tool for sharing data with responsible third-party apps. Since the bogus invitation is being routed through Google's real system, nothing is misspelled, the icons look accurate, and it's hard to know something's gone wrong until it's too late. Google said Wednesday that it is working to ensure this type of “spoofing” doesn't happen again. “We have taken action to protect users against an email impersonating Google Docs, and have disabled offending accounts,” the company said in a statement. Google later said that it was able to put a stop to the attack within an hour of discovery. It also said 0.1 percent of Gmail users were affected by the attack; with more than a billion users, though, that adds up to over 1 million who may have been hit by the spam. Gmail users on Android also got an upgrade from Google Wednesday when the company began rolling out a feature that warns you if you're about to fall victim to a known phishing scam. 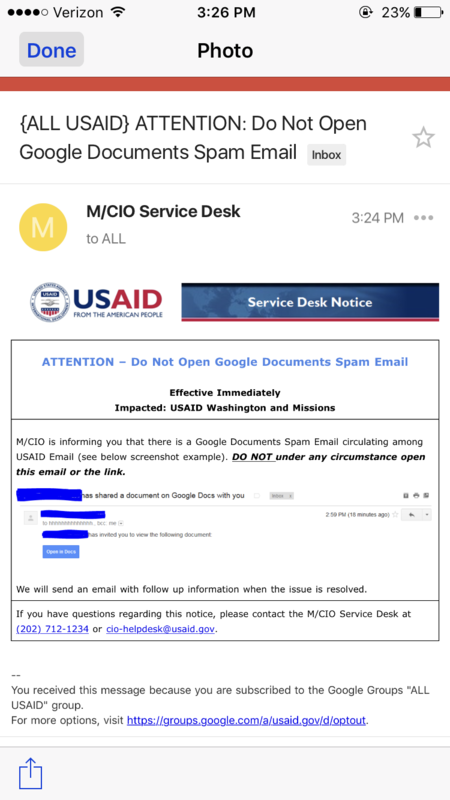 Staff at The Washington Post, students at New York University and even workers at the U.S. Agency for International Development have received warnings from IT administrators not to open the fraudulent Google Docs emails. Here is one such notice, obtained by The Post. Here's one clue for identifying the fraudulent email: Included on the string of recipients is an email address that begins “hhhhhhhhhhhhhh” and ends in “mailinator.com,” a website that lets visitors obtain a temporary and disposable email address. So, until you hear otherwise, it's probably best to hold off on any Google Docs usage for now. If you've clicked the link in the malicious email, you can revoke the attacker's access by visiting https://myaccount.google.com/permissions and deleting the “Google Docs” app — which is the one pretending to be legitimate. Brian Fung covers business and technology for The Washington Post. Before joining The Post, he was the technology correspondent for National Journal and an associate editor at the Atlantic.